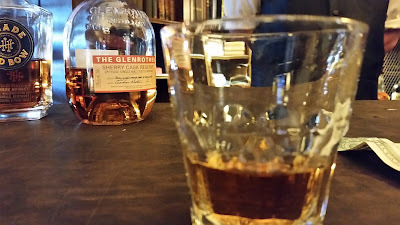 The Glenrothes Sherry Cask Reserve - AoM: Beer et al. I loved the smell of this whisky. I asked the server for something sweet and this is what he recommended. I had it neat. The glass was still warm (from drying) and that in turn warmed the whisky; it was nice. The first sip tasted lovely, but the next sip was stronger than the first. I thought this might have been due to the glass/drink returning to room temperature.